CALCE and the Hong Kong Polytechnic University have begun collaboration on a proposal for a joint research center within the developing Hong Kong Science and Technology Park (HKSTP) following a 2015 Memorandum of Understanding between the two, which includes joint research activities and student and faculty research and exchange programs. 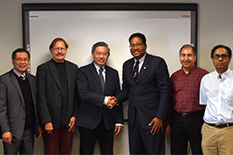 Due to the University of Maryland and CALCE’s achievements in education rankings and their track records for global collaboration, this partnership has found support from the Hong Kong Electronic Industries Association (HKEIA), which anticipates a partnership with CALCE and the University of Maryland to be beneficial for all parties. Recently, CALCE and the A. James Clark School of Engineering hosted a delegation team from HKEIA, including Prof. H.C. Man, Dean of Faculty of Engineering and Chair Professor, Hong Kong Polytechnic University; Prof. Winco Yung; Dr. H. L. Yiu, Head of Advanced Manufacturing at HKSTP; and Ms. Jan Yeung, Head of Corporate Communications for HKEIA. During this visit, the Dean of the Clark School of Engineering, Prof. Daryll J. Pines, joined the conversation on a proposal to make CALCE and the University of Maryland a partner in HKSTP, which aims to revitalize, modernize, and promote industrial growth and scientific innovation and advanced manufacturing. Dean Pines was in support of the proposal, which CALCE is preparing with the assistance of the Office of Vice President for Research. CALCE has collaboration agreements with many international universities and continuously welcomes partnering with and mentoring international researchers at all levels—from internship to visiting faculty. Both CALCE and our overseas partners have benefited greatly from the insights gained from visiting scientists from industry and academia.